I feel like it’s been ages since I put a recipe on here so I really wanted to share with you my lunch today! 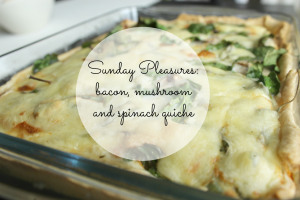 I made a very quick and easy quiche that takes about 15mins to prepare and 35mins in the oven. Ideal for a lazy Sunday eh? Now I know that homemade pastry is preferable but I had the ready made ones and sometimes they are just more practical! Thanks for promoting and uplifting the sprite of other bloggers by promoting,encouraging and supporting their posts and blogs. Whenever you wish, you are most welcome at my blog or your home, because best friends always comes without prior notice or without prior invitation, your previous post was absolutely awesome and I have read from the both the blogs where it is re blogged, keep it the wonderful work you are doing.